On our way to Santa Fe, we drove through Albuquerque, where we planned on stopping just for lunch, since the guide book was unconvincing in its description of the many strip malls. However, we spotted the American International Rattlesnake Museum – one of the only places that boasts a live rattlesnake buffet – all you can see at one time. It was quite frightening and thrilling at the same time. They were all locked up in cages, but both Pat and I were tense, and I think at one time we both jumped (my skirt had rubbed against his leg). A few were rattling, but most were calm. 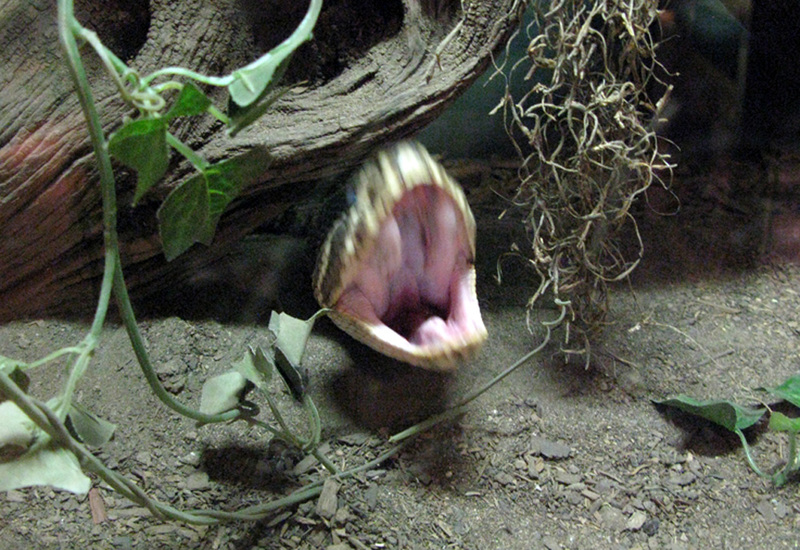 Contradictory to how it might look, the 6-foot rattlesnake below was actually yawning, not attempting to attack us through the glass. It was scary nonetheless. Warning – for those of you with a snake phobia, I suggest you skip over these pictures. 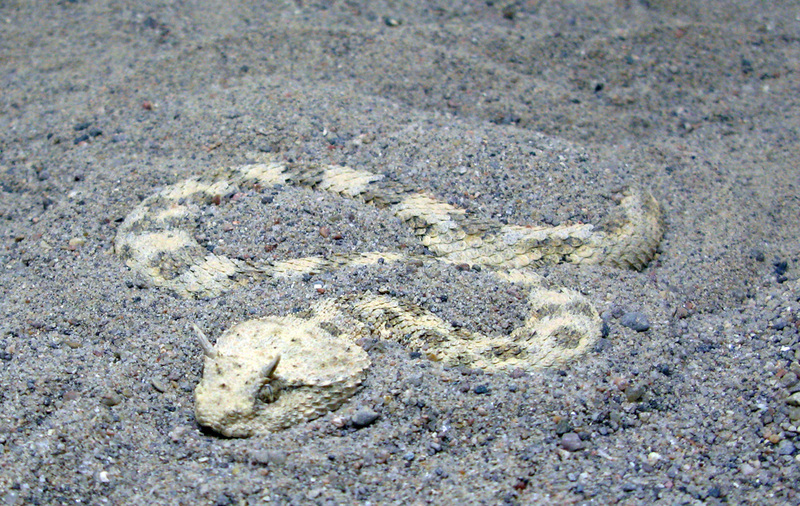 A ferocious rattlesnake - or just yawning. 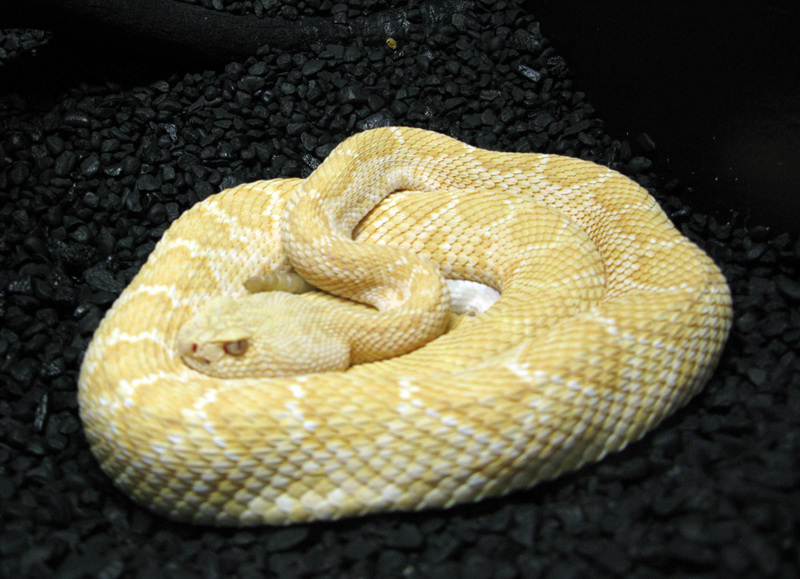 The albino rattlesnake looked grumpy. The horned rattlesnake was our favorite, so well camouflaged! We decided to take a more scenic road to Sante Fe (we always choose the scenic route) and hopped off Interstate 25 to make our away along the Turquoise Trail National Scenic Byway, a drive through the mining towns of Golden, Madrid and Cerillos, where a community of artists have set up shop to display their handiwork. 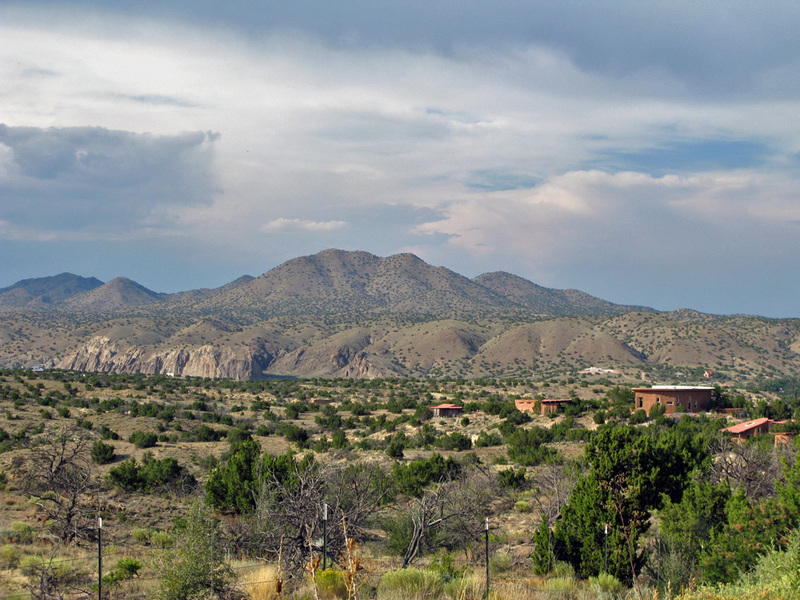 The name originated from the blue-green turquoise that was first mined by the early Pueblo people (900 A.D). We made a quick stop in Madrid (with an American emphasis on “Ma” not “drid” – to my surprise being so close to a Spanish speaking country). We have to admit that we were mostly lured by the National Guard helicopters circling the town. We asked a few locals if there were criminals on the loose. The answer: a yearly ritual searching for plants – aka marijuana. Interesting use of resources we thought. 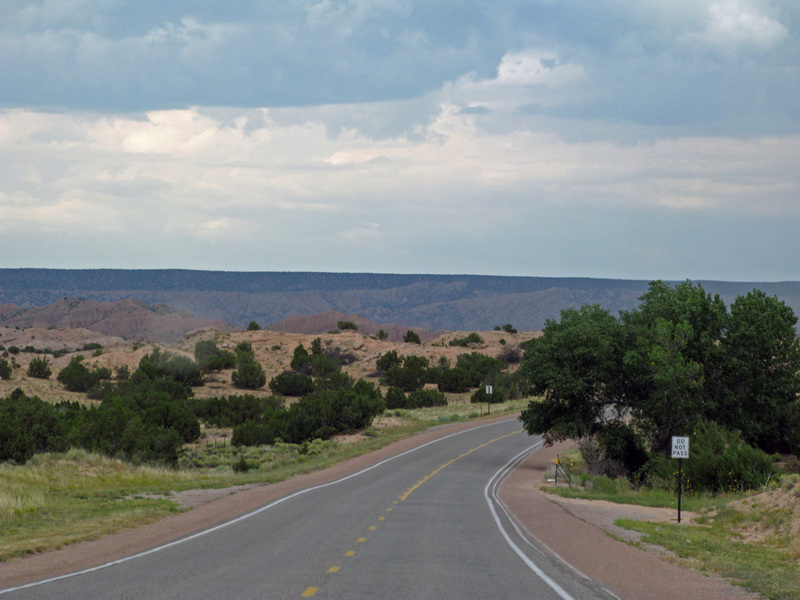 On the scenic road to Santa Fe. After browsing through the eccentric artwork, we continued north towards our destination. Now, New Mexico is definitely one of the most beautiful states we have seen so far. However, the state is not known for safe driving. I believe it has the highest DWIs in the country. Thankfully we didn’t experience that firsthand, but we did narrowly escape a crash when a moronic older woman driving a minivan in the opposite direction attempted to make a left turn right in front of us. Pat was cruising at about 45 MPH (the speed limit) and had to lock up the brakes, then expertly swerved to avoid hitting her head on. It definitely shook us up – at this point in time, most of our livelihood is wrapped up in the Jeep. 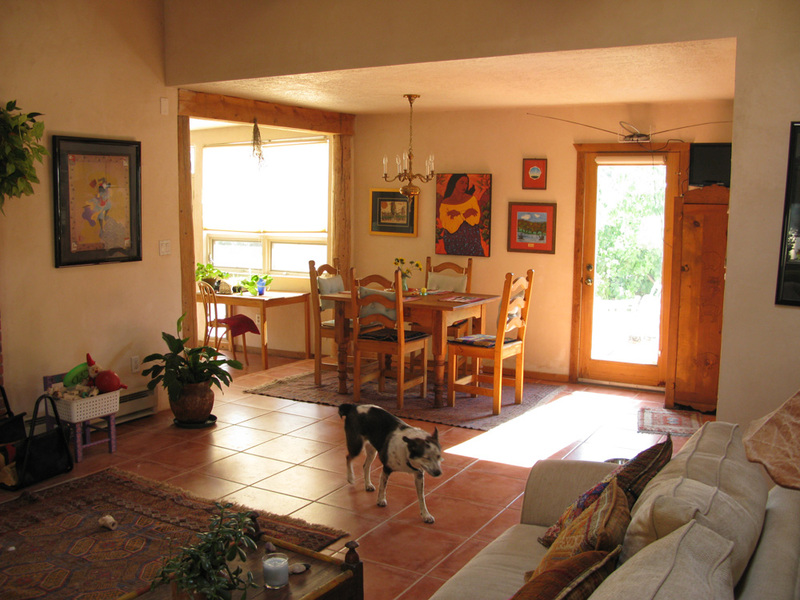 We finally made it to Santa Fe in one piece and were greeted by Laura, and her two dogs Patty and Tessa, who generously opened her doors for us while we took our time exploring the city. Laura, one of Pat’s dad’s friends who used to live in the US Virgin Islands, cooked us a wonderful pasta dinner and shared interesting stories about her time traveling in Thailand and India. We fell asleep that night well-fed and in extreme comfort – thank you Laura! Laura's home was warm and welcoming. Tessa and Patty were very excitable. The next day we caught up on a few chores and headed downtown to roam around. 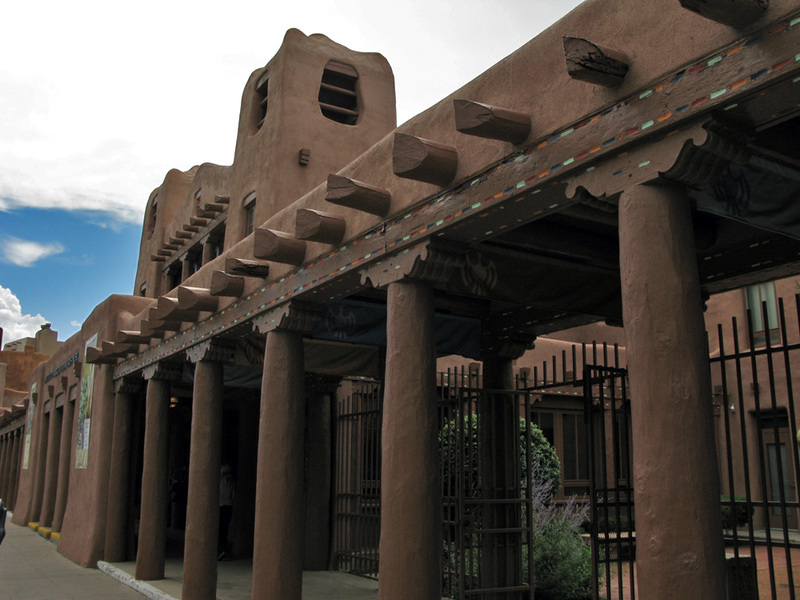 Santa Fe is a beautiful, low-key city—named the most creative city by the UN in 2005—that reflects both a Native American Pueblo and Spanish ancestry. 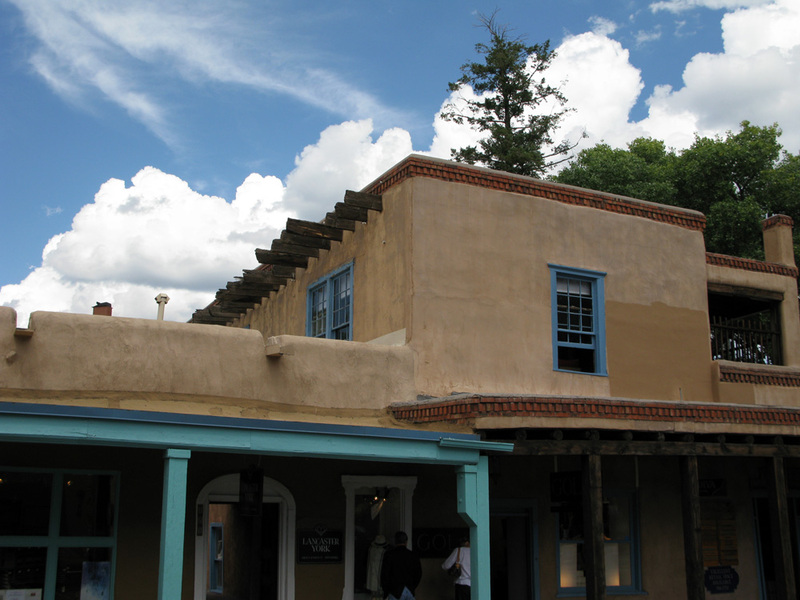 With a pervasive adobe-style architecture (mandated by the city), all the buildings are very unassuming and blend in so well against the Sangre de Cristo mountains. Along a section of the main plaza, Native Americans sell their handmade jewelry of silver and turquoise. You walk a few steps further and you’re bound to run into an art museum. Pat had some freelance website work to complete, so I wandered around and went to see the Loretta Chapel with its famous spiral staircase. 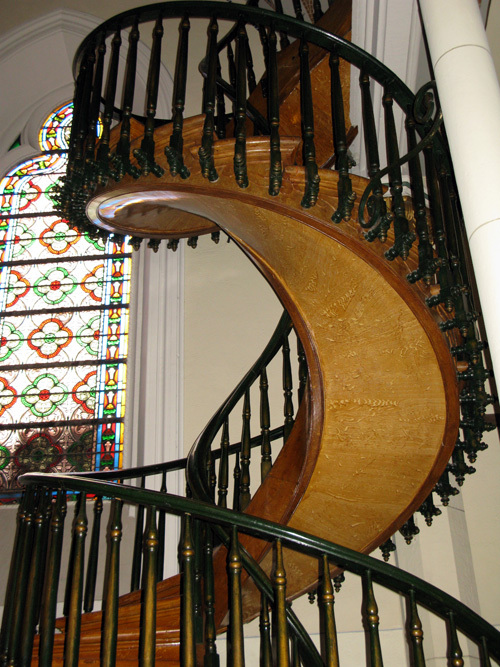 Legend has it that a mystery carpenter came through the city and built the “Miraculous Staircase”, a spiral staircase made out of wood with two 360 turns and no visible support. We explored the city a bit more and retired to Laura’s house to relax. Inspired by the previous night’s conversation, we went to an Indian restaurant for our final dinner with Laura. 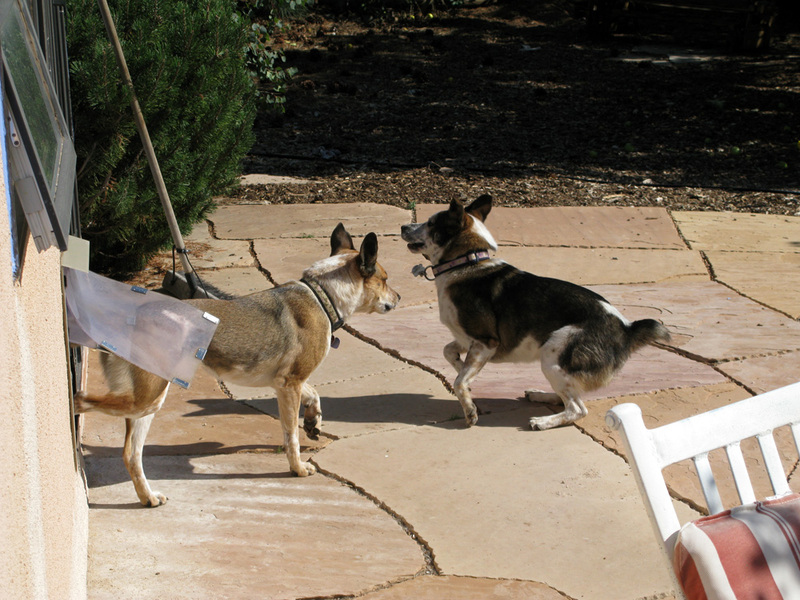 She was a gracious host, and made us feel right at home in Santa Fe. Adobe architecture near the plaza. We woke up semi-early the next day and headed for the trails to do a bit of mountain biking. I quickly realized that the level of difficulty out West is a bit higher (or maybe the trail descriptions simply underestimate), since I had to walk next to my bike most of the time; for example, during a 1-mile straight uphill singletrack section with a pretty steep drop off. Fortunately there were a few sections that leveled off and I practiced going over rocks and logs. Of course it wasn’t a struggle for Pat and he acted as a great mentor during the tough spots. 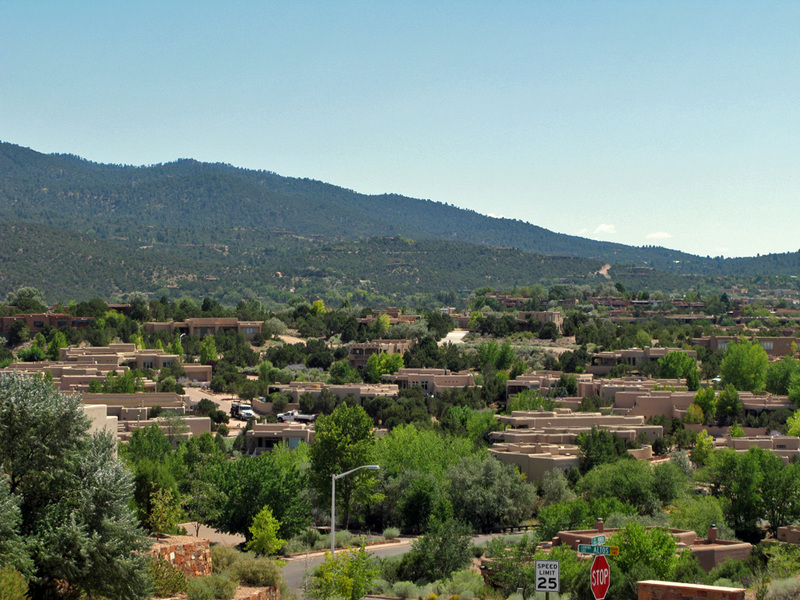 Though we were probably both affected by the altitude—Santa Fe sits at 7,500 feet. After a grueling workout, we treated ourselves to delicious green chile enchiladas at a local restaurant The Shed, and got a few stares from the patrons in our biking attire. Oh well. 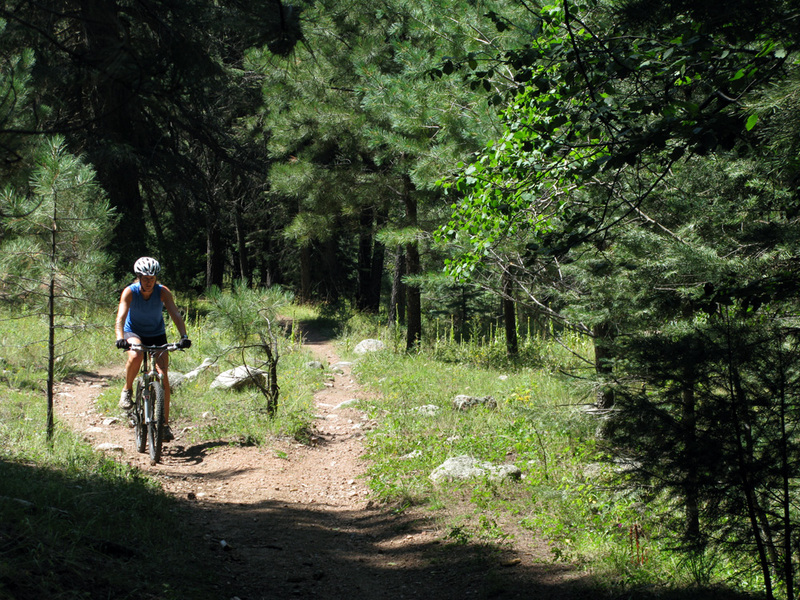 On the trail in the Santa Fe National Forest. Our bikes - happy to be on dirt again. We showered, packed up the car and hit the road again to explore another artsy city tucked away in the Carson National Forest – Taos. 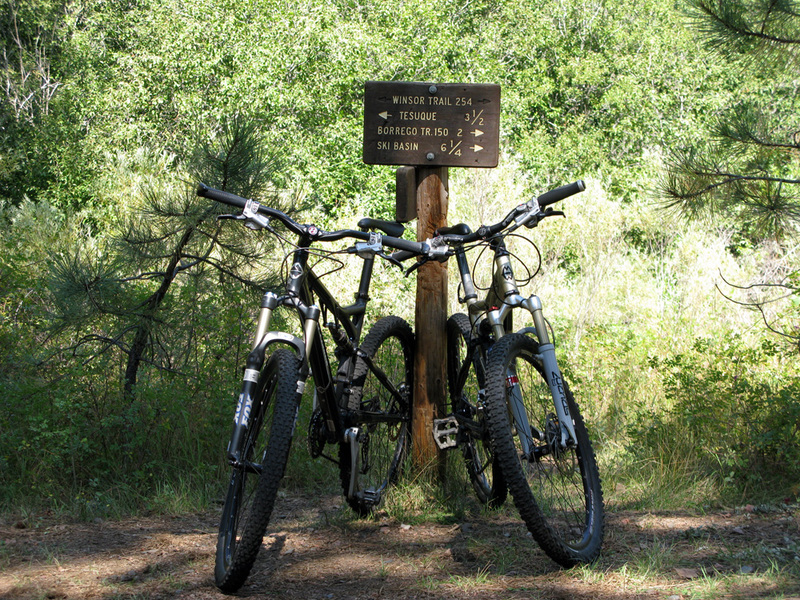 We took the “high road” to Taos and got gorgeous views of sandstone cliffs and pine forests. Before getting to Taos, we found a remote campsite in the National Forest – for free – and filtered our own water from the nearby stream for the first time on the trip. On the "high road" to Taos. 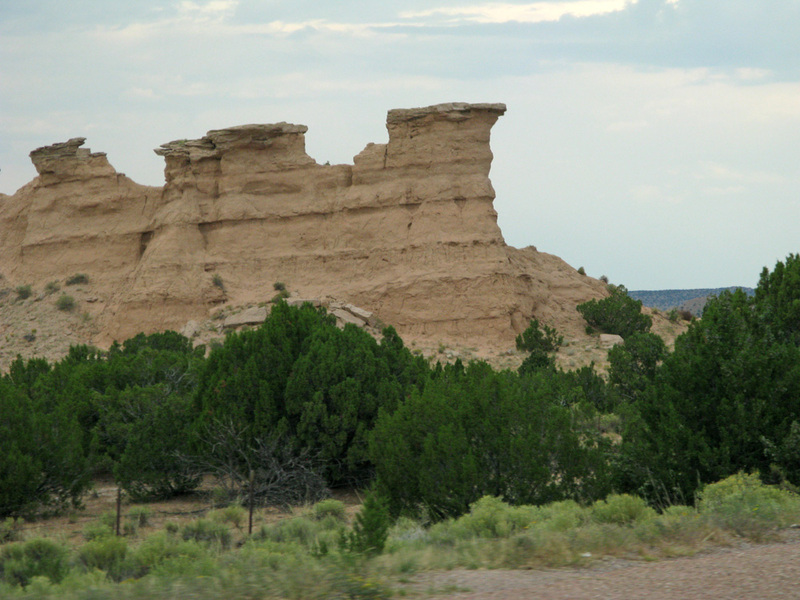 Sandstone rock formations on the "high road." Hi guys! Thanks for all of the awesome pictures and updates on your trip. I check the site just about every day and it is great to see what you are doing. 🙂 Be safe and have a great time! Sweet, keep on keeping on! Great blog of your adventures. 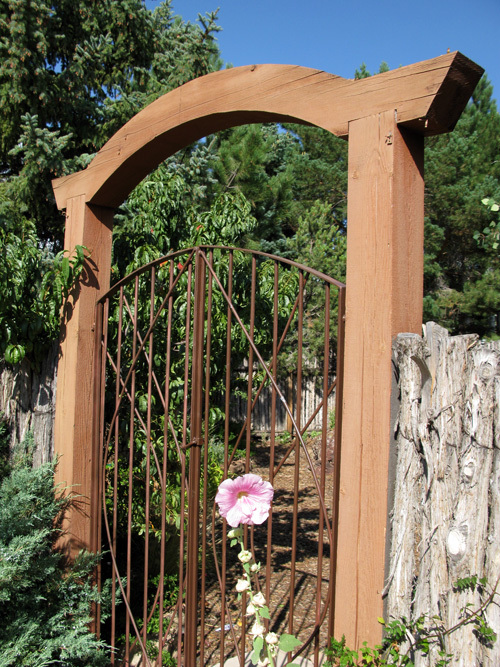 My sister-in-law, Angela Korrell, guided me to your site. Love the tent. Where did you find that? My husband, Gideon (who you may know), and I are about to embark on our own cross-country andventure. We are taking a more northern route. We leave on 9/16 and will be blogging as well at http://www.emilyandgideon.blogspot.com if you want to follow along. Hope you are having a great week on the road!